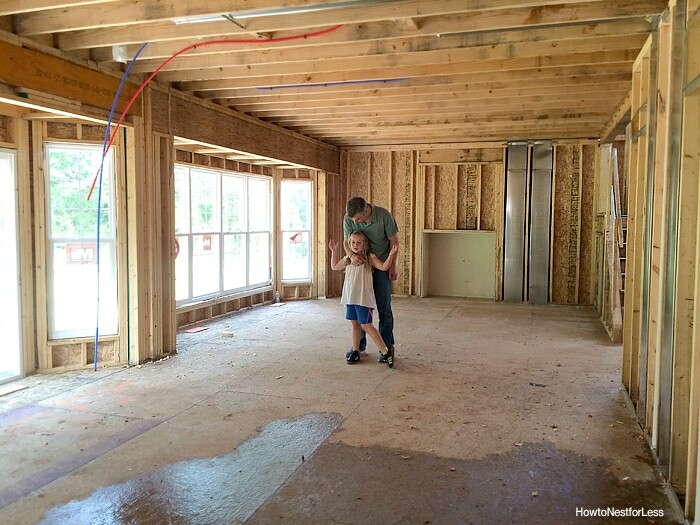 I’m happy to say our house is moving along! The entire thing is framed out and they’re starting to put on the roof. Next will come drywall. We’re hoping we have less than 2 months to go. 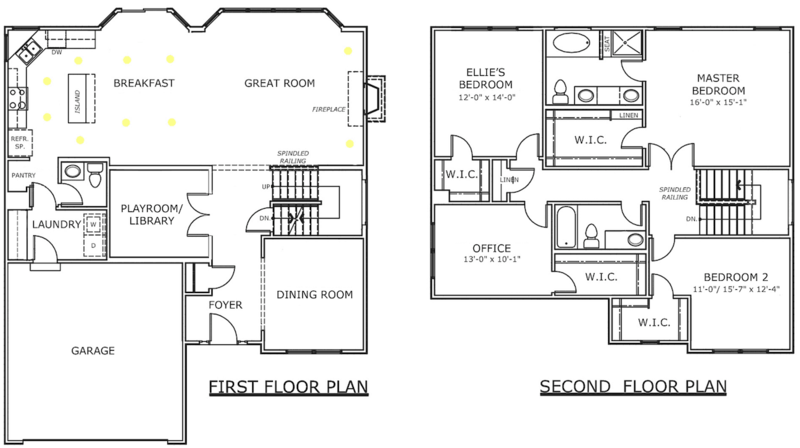 In case you don’t remember, here’s the floorplan of our new place. We actually modified it slightly since you last saw it. Basically we made a little playroom space on the first floor instead of the second floor so Ellie (and my 2 nephews that will live 3 doors down) would have a place to play within an arm’s reach. We are putting French doors on the room so we don’t have to hear them fighting over Legos though. I’m pretty excited about our kitchen in the new place even though it’s pretty identical to the layout of our old one. Then just off the kitchen is our laundry room with sink (thanks for insisting on that one!) 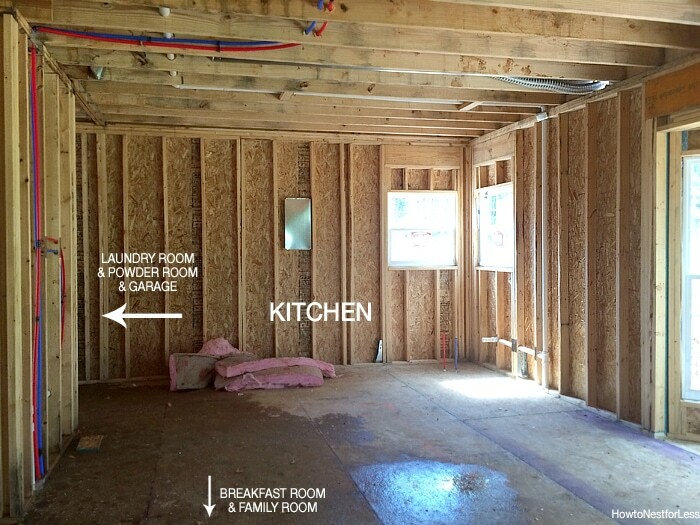 and our powder room, plus access to our garage. 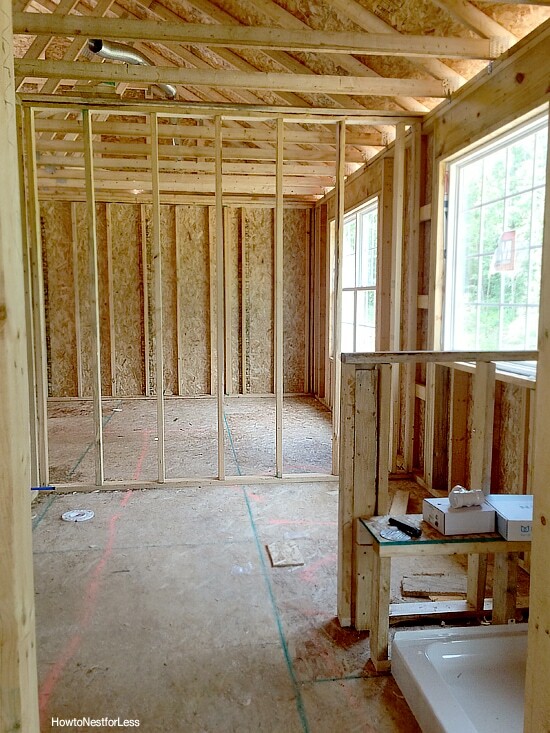 Below is a photo of our soon-to-be family room with gas fireplace and large bay window. And here’s a shot of the foyer. 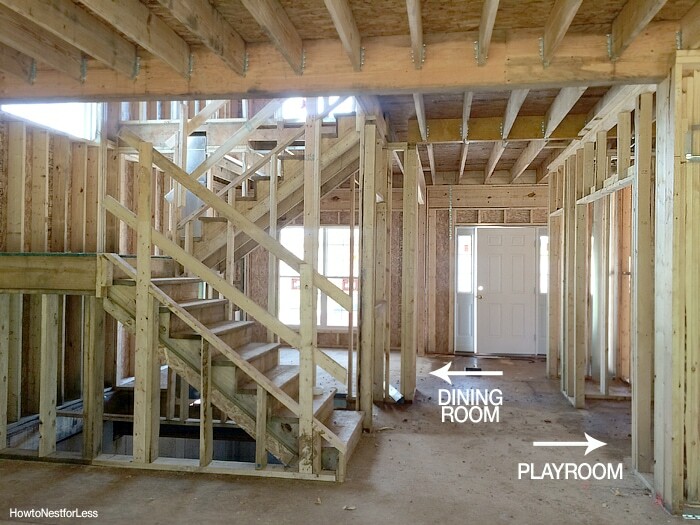 You can see the opening to the playroom on the right and our dining room on the left. Yeah, I know our dining room is far away from the kitchen, but honestly who uses their dining room more than once or twice a year? We didn’t use it once in the old house actually. I guess we need to host more dinner parties? Upstairs we have the master bedroom. Don’t worry, our tub won’t stay in the middle of the room. At least I hope. 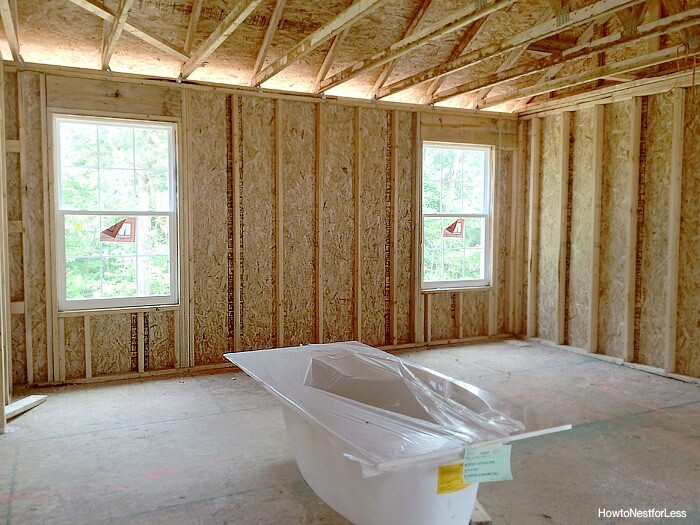 Here’s a view of the master bathroom where the actual bath will go. And through the framed wall you can see Ellie’s bedroom. This kid keeps going back and forth on designs for her new space. Her latest idea? A sports themed room in blue and purple with a huge scoreboard over two twin beds, one side saying Home and the other side Visitor… ya know, so the kid visiting will sleep under the Visitor sign? Yep, all her idea. Look for this kid’s creative blog in 2030. 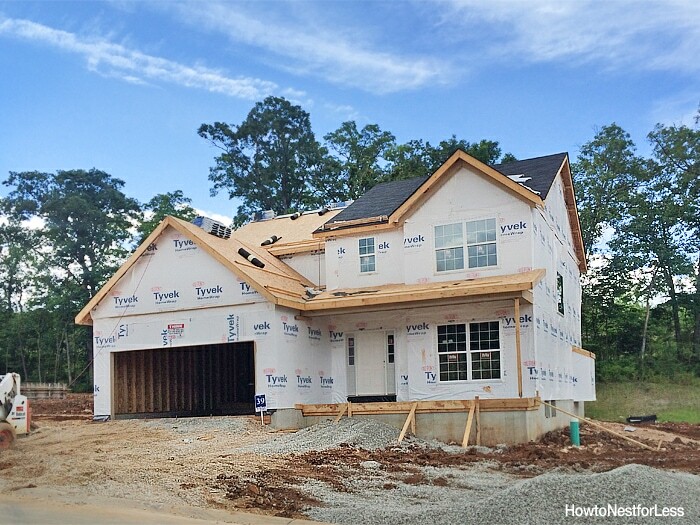 So they’re pouring the driveway and porch tomorrow, then finishing up electric before they start the drywall. Can’t wait to show you guys that update. 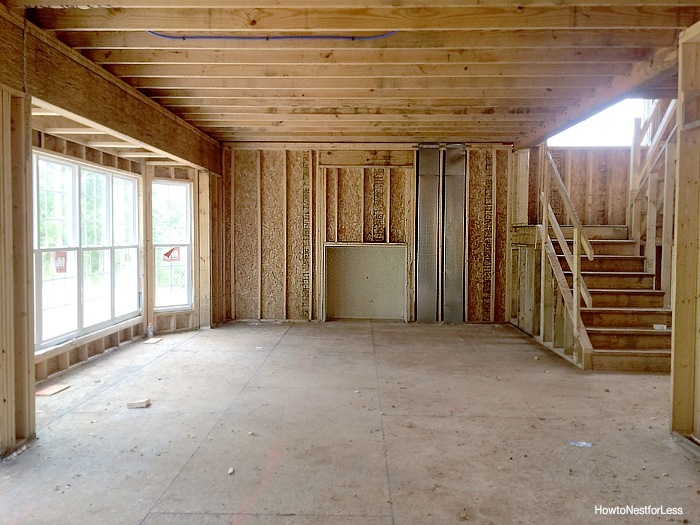 This house will look totally different. Yep, closing countdown is officially on! How exciting! It looks great! Congratulations on your new house! I hope you guys get to move in and start decorating soon! How exciting! Thanks Lauren! I’m so excited to get in there to start decorating! “Home” and “visitor” signs? Love it! Oh my she is learning well from you!! So exciting.